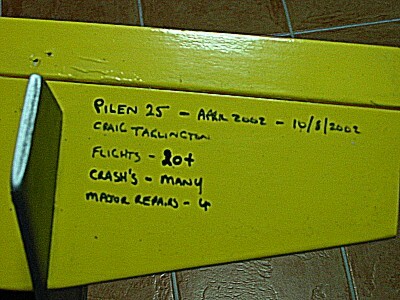 Pilen died when it hit a pole at slow speed when coming into land, this is all that remains. As you can see it did have a pretty good life. Building was finished in April 2002 and it died on the 10/8/2002 (Same day as my Easy Sport 40....I was not impressed!!). With 20+ flights, many crash's and 4 major repairs. The wing was salvaged and used on the Pilen II, so all in all it was not a bad outcome. I do not have any photos of this as yet, but below is a thumbnail of the DXF CAD File of the design. I am not sure who the original designer is, as the file I got had no info in it. If it is you please contact me and I will update it to show your details. The aircraft flies very well, it will hang on the prop and rolls are so fast you cannot count them. Mine was powered by a OS 25FP with a 9x5 Prop and controlled with a Hitec System X 5 Ch. Radio on 3 servos. Construction is straight forward, give it a go it will not let you down. I have crashed mine many times and I just glue it back together and up it goes again. 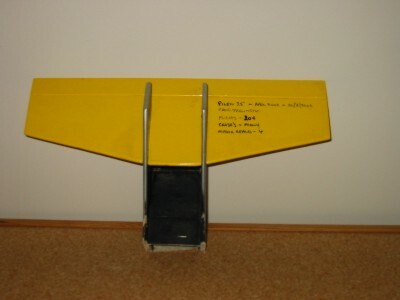 One word of advice, fit the wing with the Aileron Servo facing out from the fuselage. This will stop the side of the fuselage getting broken if you do crash. I found this out the hard way. Also make sure that you get the balance right, even thought the drawing show the receiver at the back, I had to fit everything into the nose to get it to balance and then I still had to add weight.